Early in “Tab Hunter Confidential,” a former high school classmate reveals that the female student body had a crush on Arthur Gellen. These young ladies didn’t wait until Sadie Hawkins Day to pursue him, either; they pounced whenever he walked down the halls. The attention was so prevalent that the preternaturally shy Gellen ducked into empty classrooms to escape the onslaught. “He had to lock the door behind him,” the classmate says. The kid with matinee idol looks eventually garnered a matinee idol career to go with them, emerging into the spotlight with a new moniker and years of experience being chased by an adoring public. Arthur Gellen became Tab Hunter, and Tab Hunter became an enormous success in post-war Hollywood. Women swooned for Tab Hunter—he was drop dead gorgeous and couldn’t seem to keep his shirt on in his movies. “Six feet of rugged manhood,” was how he was advertised, and he was a double threat as a singer and actor. The man for whom Jack Warner created Warner Bros. Records sold millions of albums while carving out a movie and television career. To keep the young ladies in a perpetual frenzy of hormones, the studio sponsored “Win a Date with Tab Hunter” contests and paired him socially with equally gorgeous stars like Natalie Wood and Debbie Reynolds. The Hollywood machine presented these romantic fantasies to a general female public who didn’t have a snowball’s chance in Hell of snaring Tab Hunter, or any male celebrity for that matter. And they fell for it. Of course, Tab Hunter had many male admirers as fans (George Takei and John Waters as presented in this film as examples), but Hollywood didn’t dare consider their existence. This was the 1950’s, and such things were not part of a star’s marketing strategy. Actors like Hunter who were gay were not openly so, as homosexuality was a criminal offense that was also considered a mental illness. 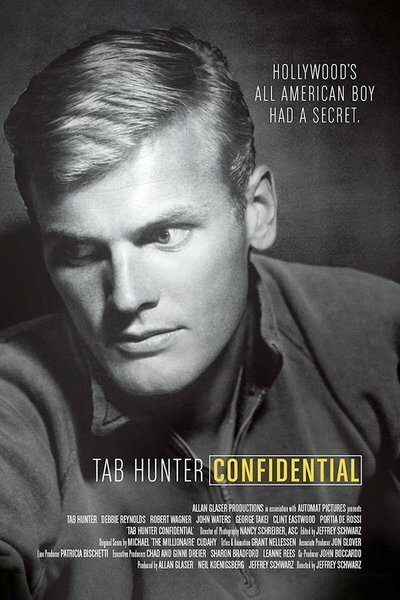 “Tab Hunter Confidential” uses Hunter’s story to explore how Hollywood kept its actors closeted by any means necessary, and whether that environment exists in more subtle fashion today. Tab Hunter serves as our tour guide, spinning stories of his upbringing, career, romances and his retirement. He begins with a bit of foreshadowing at a cocktail party on October 14, 1950 in Los Angeles. “Parties like this were illegal,” he tells us, because of “boys dancing with boys and girls dancing with girls.” Eventually, the cops show up to “arrest a bunch of queers,” as Hunter puts it, and the lawyer who springs him gives him a stern lecture on protecting his burgeoning career. “You have to be a lot sharper than you are,” the attorney tells him, because the surest ways to end one’s Hollywood career were to be perceived as a Communist or a homosexual. While the government hunted the former, magazines like “Confidential” went after the latter. Warners squashes the “Confidential” story, countering it with all its studio muscle, but “Tab Hunter Confidential” has other stories of potential exposure to tell. Hunter speaks candidly about his relationships with Anthony Perkins and figure skater Ronnie Robertson. He points out how difficult it was for two men to be seen together without eliciting gay rumors. While he and Perkins combated this by double-dating with women, Hunter’s time with Robertson aroused enough suspicion that it may have cost Robertson his first place finish at the U.S. Figure Skating Championship. Director Jeffrey Schwarz has made an entertaining, fast-paced and informative film. He supplements Hunter’s life stories with numerous film clips. “Damn Yankees” exists comfortably with “Lust in the Dust” and John Waters’ Odorama classic “Polyester." Schwarz also offers a slew of well-chosen talking heads like Clint Eastwood, Rex Reed, Connie Stevens, several non-celebrities who knew Hunter, Hunter’s current partner, Alan Glaser and the Czar of Noir, Eddie Muller. Everyone has something interesting to say. Muller, who co-wrote with Hunter the book this film is based on, raises a challenging idea about today’s Hollywood. “In some respects, the business is still as it was in the ‘50’s,” he says. Homosexuality may be far more socially acceptable than it was in Hunter’s heyday, but gay rumors about actors carry the same stigma they always did. Hollywood remains terrified that the hunky male product they’re selling to millions of swooning women might turn out to be gay, and “ruin the fantasy” these fans supposedly covet. One can only wonder if an openly LGBT actor can be as huge today as Tab Hunter was in his day. The verdict is still out on that.